Kaga miso is carefully made over a long period of time until it is mature, and thanks to its particular abundance of "Koji," a mold that grows on rice, it takes on richness from the sugar content of the rice. It has a sunlight yellow color and a subtle spiciness. 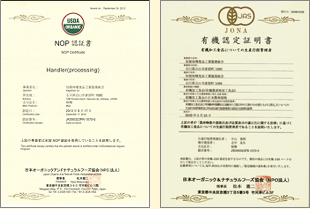 We Kagamiso Co., have been certified under JAS (the organic regulations of Japan) since 2009 and have started manufacturing organic miso. The materials used to make our miso are all produced in Japan and certified under JAS & USDA / National Organic Program in U.S.A. and of course, we Kagamiso Co., have been certified under USDA since 2010. 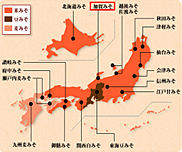 "Kaga" is the local region name of our home, southern part of Ishikawa Prefecture in Japan in Edo period. Kagamiso Co. is Cooperative union and established in 1971 by 10 miso manufacturing companies in Ishikawa Prefecture, and some of them were established in Edo or Meiji periods, over one hundred years ago. Copyright(c) 2012 ISHIKAWA FOOD Association All Rights Reserved.